ST. PETERSBURG, Fla. — The baseball was lifted, high enough that it caught on a speaker in a park known for its quirks. Dustin Pedroia didn’t move, didn’t run toward first base, didn’t do much of anything. He also didn’t really know what was going on. Hardly, given how Pedroia broke out of his 0-for-19 skid with two singles and a double last night. And even though he didn’t know the Tropicana Field ground rules — “I try not to listen to Tito, DeMarlo, or any of our coaches. I don’t want to get dumber’’ — Pedroia finished the third-inning at-bat with a single, starting the three-run rally that would propel the Red Sox to a 6-1 win over the Rays in the opener of their three-game series. Pedroia and the offense can take full credit for this one. A lot goes to Clay Buchholz, whose continued maturation and in-game adjustments have helped the Sox begin to turn their season around. It was Buchholz who began a dominating run by Sox starters when he pitched eight strong innings against the Twins last Wednesday. With six sharp innings last night, the starters are 5-1 with a 1.64 ERA in the last six games, and the Sox have won six of seven overall to move within reach of the Blue Jays and Yankees in the AL East, though they are still 7 1/2 games behind the Rays. The pitch, which Buchholz can alter by changing the pressure on his grip, was so effective that the pitcher got out of jams in the first and second innings without allowing a run. With one out in the first, he gave up a single to the speedy Carl Crawford, the kind of moment that could unnerve the young righthander. But it didn’t, even after Ben Zobrist singled up the middle and Evan Longoria hit an infield single to shortstop to load the bases. Buchholz (6-3) got catcher John Jaso to ground toward Marco Scutaro near second base on a two-seamer, and the shortstop turned a double play, stepping on the bag and throwing to first. There was more trouble in the second, as Buchholz walked Carlos Pena with one out, and B.J. Upton singled and advanced to second when center fielder Jacoby Ellsbury threw to third. But Reid Brignac went down swinging. So did Jason Bartlett. After that, Buchholz had little trouble, getting 14 of the next 16 batters — the exceptions being a Pena solo homer in the fourth and a Bartlett double in the fifth. The Sox ended the game by getting 14 straight outs between Buchholz, Hideki Okajima, and Daniel Bard. The Sox certainly outpitched the Rays as Wade Davis lasted just 3 2/3 innings, throwing 40 pitches in the three-run third. He allowed a home run to David Ortiz in the second, and the next inning gave up a bases-loaded walk to J.D. Drew and consecutive two-out RBI singles to Adrian Beltre and Jeremy Hermida. 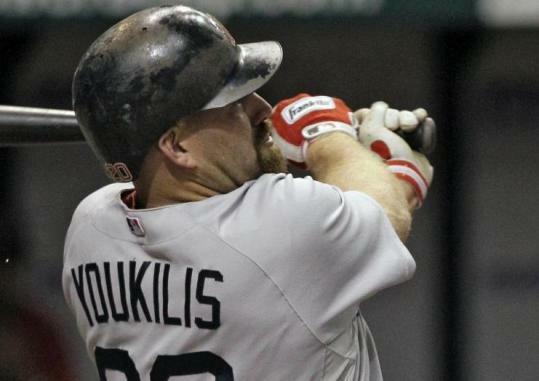 A two-run homer by the smoking-hot Kevin Youkilis, off Lance Cormier in the fourth, completed the scoring. Buchholz wasn’t at his best, but he was effective enough, striking out eight. He also walked just one batter. That means over his last two starts, spanning 14 innings, he has issued only two free passes. In his two starts prior to that, Buchholz issued 10 free walks over 11 1/3 innings. The Sox moved to 5-15 at Tropicana Field since Sept. 23, 2007. It’s not much, but it’s a start, especially with the Sox playing their best baseball, and facing a team that swept them in four games at Fenway Park last month.